a) Bagdogra Tea Estate : The tea garden is in Terai Region of North Bengal, about 15 kms. From Siliguri and adjacent to Bagdogra Airport. The total area under plantation is 614.86 acres and produces 30 lacs kgs. of made tea annually out of its own leaves and brought tea leaves. b) CTC Tea Factory (Terai Tea Factory Unit) : The company has set up this unit in the month of November, 1997 with an objective to produce CTC tea from the green leaf purchased from different suppliers. The unit produces 20 lacs kgs. of tea annually. c) CTC Tea Factory Unit (Adhikari Tea Factory Unit): This unit was commissioned on 17th February 2002. The present installed capacity of the unit 25 lacs kgs. of CTC tea per annum. The unit is at present running at its optimum capacity. d) CTC Tea Factory Unit (Karjeepara Tea Factory Unit) : This unit is being set up by the company to manufacture CTC teas out of bought leaves. The unit has stated commercial production on and from 1st week of July 2003. The Installed Capacity of the unit is 25 lacs kgs of made tea per annum. 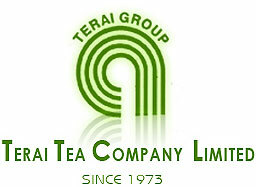 The combined annual production capacity of Terai Tea Company is 10 Million Kgs.